If you missed the event in early April, you are welcome to attend to this event specially organised for you, where you will meet like-minded international global minds. This is your opportunity to create a wide professional and personal network and to share your experiences of living and working in this romantic city. 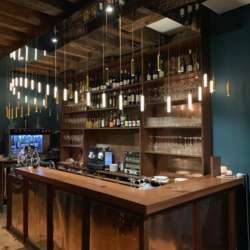 You are welcome to this wine bar/ restaurant with a warm cosy decor and ambiance that diffuses a refined taste, authenticity and creative emotion of the artistic owner. There is no entrance fee. You pay for what you order. There is a wide selection of wines to choose from.